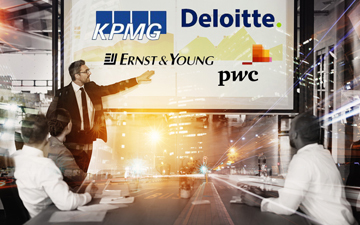 TORONTO, July 10, 2018 – The ongoing digitization of the Canadian financial services sector is driving consulting revenue at the Big Four accounting firms in Canada. But healthcare digitization is the fastest growing sector in consulting, according to “The Canada Consulting Market in 2018,” a new report from Source Global Research. But a deeper dive into the numbers uncovers some surprising revelations about consulting in Canada. The business is booming in Canada, as demand is growing in every economic sector and consulting line, with a 4.9 per cent growth rate in 2017. “We’ve got a lot of calls coming in from clients — the phone is ringing a lot, which is great news for us,” enthuses Linda Williams, a partner at EY Canada’s advisory services. Source Global Research report, 2018. Bay Street in Toronto is ground zero for the largest drivers of consulting revenues in Canada, as the head offices of the Big Four accounting firms and the Big Six banks are loctaed within blocks of one another. Overhauling legacy IT infrastructure was a priority in 2017 for the financial services sector, as was the growing demand for data and analytics initiatives. The demand for fintech assets also provided consulting firms with opportunities to act as facilitators between the financial and technology sectors respectively. According to Williams, “Healthcare is once again a star sector this year, as it was last year, specifically in the public sector. There’s a lot of demand to redirect cost toward modernising service to Canadians.” An ageing population and a highly competitive environment are seen as the primary factors driving consulting capacity. 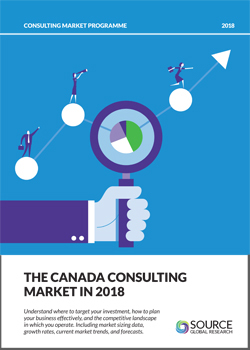 Canadian clients demonstrate a clear bias towards hiring consultants for their specialist capabilities rather than capacity to fill internal gaps. This suggests that the ongoing march of the Big Four to accumulate technology, legal and management expertise through acquisition will continue. As 2020 nears, watch for growth ranging from two per cent at the low end of the scale (pharma and biotech) to seven per cent at the high end (healthcare and financial services), with plenty of capacity to grow.